I am completely taken with the P.S. Write Soon stamp series (I gushed about them here last week!). The postage was issued on February 25, 1980 to commemorate National Letter Writing Week. How great is that?! The face value was a mere fifteen cents. Best of all, each sheet had multiple designs, all of which needed a good lick to stick. The stamps focused on the importance of letter writing, using phrases like “Letters Lift Spirits” and “Letters Preserve Memories”. I recently snagged a full sheet of sixty on ebay–victory! 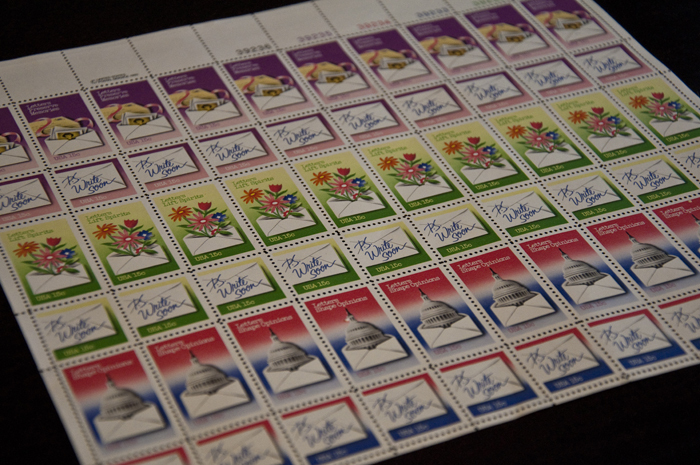 Do you have a favorite stamp? I’m also quite taken with the recent love stamp issue–swoon! P.S. More exciting vintage stamp news!